There’s been a lot of talk lately about chat as an interface (something Dan Grover’s hit on first.) 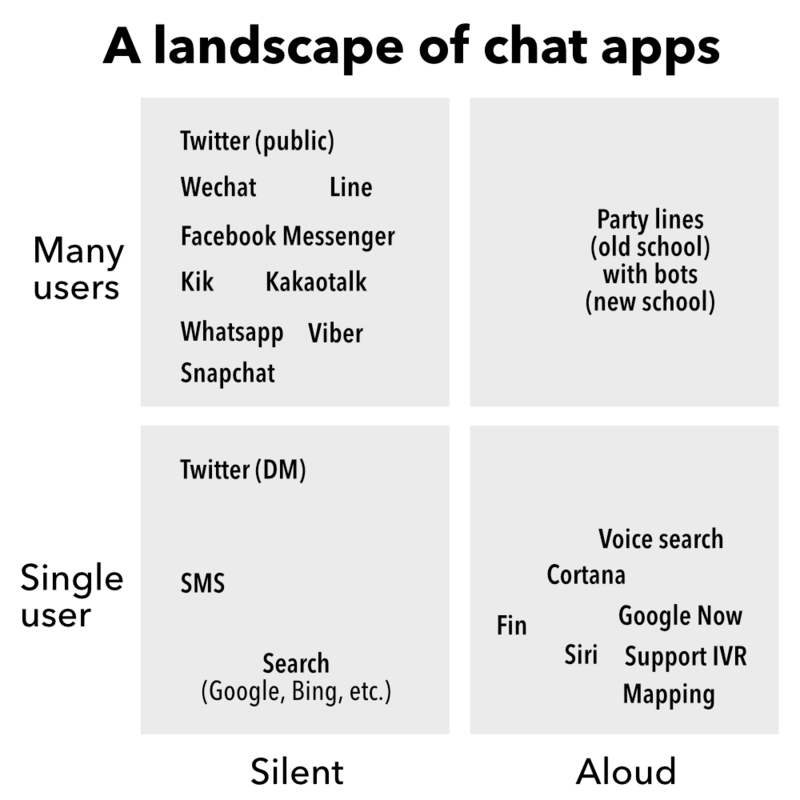 It’s fueled by the rapid adoption of Slack, and announcements that other companies, from Wechat to Facebook to Kik, are rolling out bots and opening APIs to let algorithms join us in chatrooms. Facebook’s building a universal personal agent dubbed M.
There’s been less, umm, chatter about how different chat interfaces are from traditional UI/UX, and what it’ll mean when this matures. Chat has some weird consequences for developer economics, but also for how we build and test user interfaces. And from there, maybe we can make some stupid guesses about the future of human-machine interactions. Trust me, they’re pretty stupid. They involve talking to your bank account and David Hasslehoff. According to Comscore, the typical American downloads a total of zero new apps a month. We’ve got our apps, and we’re happy with them, and we aren’t looking for new ones. Just as apps clobbered the Web—over 50% of all digital engagement happens in mobile apps—so messaging is likely to replace apps themselves. There are a number of reasons for this, from the cultural transience of chat versus posting, to the way notifications drive engagement. Kik, which makes a messaging app, bought Blynk, which is a fashion app. You can order a ride in Facebook Messenger. The New York Times built a bot to help journalists decide which stories to promote—in Slack. The 600M Wechat users can send money to Western Union from chat. The way I like to think about this is: Once, we had newspapers. And the moment the paper went to print was the end of the story: it was ink, on paper, going out to a million houses. Then along came the blog, and hitting Publish was the start of the story, as sharing and engagement and feedback occurred. Mathew Ingram, ever one to turn a good phrase, once called this publishing’s False Epiphany. Now think about chat. The end of every transaction is the start of a discussion about that transaction, whether it’s a shipment of goods, a cab ride, a bank withdrawal—anything. 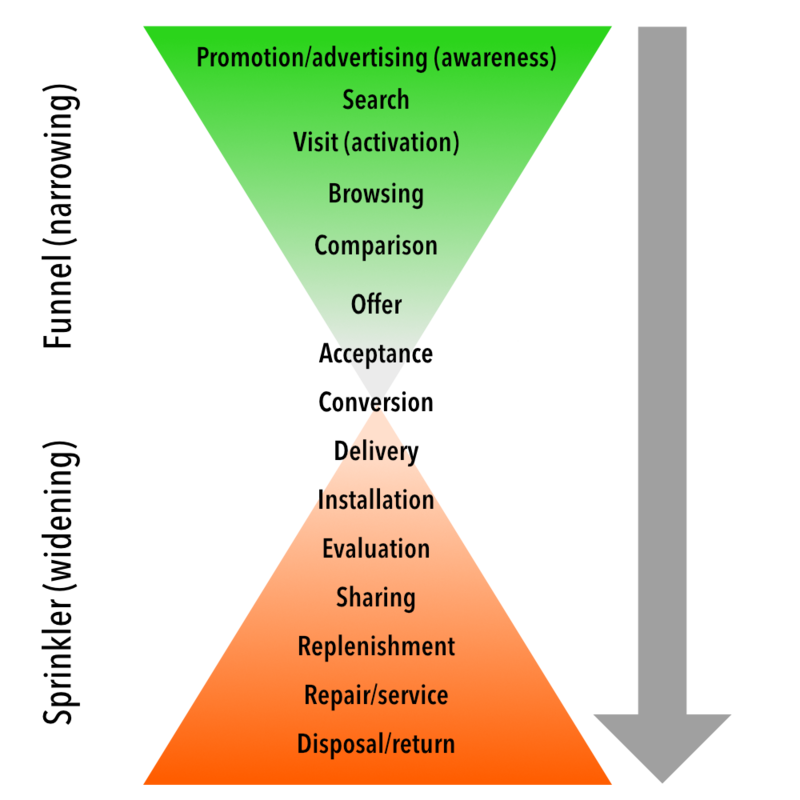 For decades, sales teams online and off have talked about a funnel, leading up to a goal. But when you think about chat interfaces, the goal is the beginning, not the end. If sales has a funnel, chat has a spout. I haven’t worked that out yet. Anyway, we need to start thinking very differently about app usage. Here are a couple of ways we’ll have to change. Ever watch someone try to use one of those old Infocom text games? 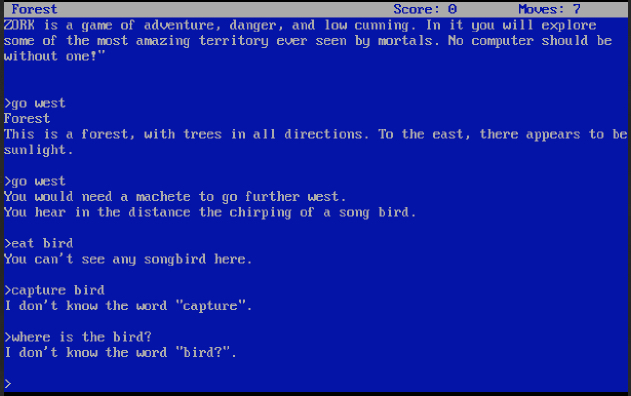 Half the time, they aren’t trying to solve the puzzle or kill the Grue, they’re just trying to figure out what words the game wants them to type in. Should you take the potion, or get it? In a point-and-click interface, the designer creates the vocabulary. There’s a finite number of buttons on a screen. But in chat, that’s not true. There are over a million words in the English language alone; multiply that by the number of languages out there. The surface area of the chat interface is almost untestable in normal ways. The algorithms behind parsing that language are getting better every day, but testing the app is going to be hard. Fortunately, debugging gets easier. If users are having a hard time with your product, it’s often hard to find out. If you make a car with the cup-holders in the wrong places, you need to run focus groups and install hidden cameras to notice it. With software, you need to track mouse movements, clicks, taps, and even where a user’s eyes are looking. Chat’s not like that. With chat, the UI is the log file. You can reproduce every interaction from every user. You can replay exactly the steps that it took to get to a certain point. You can often learn synonyms, common misinterpretations, and other problems by watching. This kind of content is known as Interactive Branching, and it’s common in call-center applications, customer support, and Interactive Voice Response (IVR) software. IVR and Interactive Branching technology is about to get a massive upgrade. What happens when it’s a standard part of Integrated Development Environments, and when UX experts borrow as much from screenwriting and dialogue as they do from design and layout? Nordstrom and Zappos are famous for their high-touch customer service. People have asked Zappos (whose support employees work for a shoe retailer) to order them a pizza—which they’ve done. Nordstrom has allowed customers to return tires to their store even though they don’t sell tires. When you have an open-ended interface, customers bring you new problems you can fix. That means every user interaction is also a survey. Once you know how to listen, users will tell you what they’re after. Get enough requests for something, and you can try out a new market or product. Chat participants classify themselves into new niches and segments based on where and how they use chat, and what they ask for. The future chat interface looks like a strange mixture of group chat, one-on-one messaging, smart agent, and search engine. The only real gap right now is the many user/out loud app, which we’ll probably see plenty of in VR environments; we already see it in gaming, and when bots join the conversation it’ll be chaotic and fascinating. Personal agents in business environments such as videoconferencing could get interesting, too. For business, chat extends the product lifecycle from cradle to grave. It begins moment you start looking for a product (via search, or talking to a smart agent from a retailer with whom you have an account), continues through payment, consumption, replacement, repair, resale, and even disposal. Which brings me to the ultimate conclusion in all this: Chat is a great interface for the Internet of Things. I don’t want to talk to my bank; I want to talk to my account. I don’t want to talk to my realtor; I want to talk to my apartment. What happens when we can chat with the things in our life? I don’t just mean asking the thermostat how warm it is. I mean having a real, dedicated conversation with your car, or your bank account, or your fridge. Yes, that sounds crazy. Nobody wants to talk to their fridge. I must be mad. But it’s a logical conclusion of all this: Everyone gets a KITT. Our car tells us when it needs oil, or when it’s time to change the tires. We ask it where it was last night, and who was driving. These are pretty open-ended dialogues. They’re also a logfile. A conversation with my car is an insurance record; a maintenance history; and a huge opportunity to sell me things. It’s also one hell of a sticky interface, likely to make me brand-loyal over a lifetime. Yes, chat as interface is strange. I’m pretty sure that tapping on an MP3 player seemed like a weird way to hail a cab, find a destination, order a pizza, and stream a movie once upon a time. When we can chat with our personal agent, or our things, it’ll seem normal. When we can start a thread with friends who are going to a festival, and their bots join in, offering tips, scheduling, and generally helping out, we’ll wonder how we ever did without it. –> yes I’m seeing this with multiple startups around me.